We are seven children and Thanksgiving is tomorrow. The turkey has been thawing in the sink for a day. Yellow onions appear on the counter, along with celery, extra butter, green apples, walnuts and loaves of soft, after-brand bread. Sometimes my mother would start the roasting the night before. This year, though, she was up and prepping early Thanksgiving morning. I am allowed to cut the soft bread, left open the day before to grow stale. A mound of white cubes grows. How will it all fit into the turkey? The sweet, pungent aroma of onions and celery sautéing in butter, and the expanding scent of sage permeate the kitchen. This ritual – the steps and stages of the ceremony – has imprinted in my bones. Mom stands upright at the stove, gently folding the bread cubes into the glistening soffritto of onions and celery, till each piece has absorbed the buttery moistness. The anticipation of the roasted stuffing excites my senses – savory and sweet, warm, moist, laced with the salty taste of turkey juices slow cooked and carefully tended. Mom carefully stuffs the bird at both ends and then sews closed the flap with thick black thread – the sight of the large black stitches jolts my eyes. Rubbing butter and sage on the outside, her hands are greasy – how is she able to touch that pimply pink flesh? Into the oven the 20-plus pound bird goes, turkey baster at the ready. For hours, Mom tends the bird, basting, checking the temperature, turning the pan, tin foil tenting for the final minutes. We inhale the delectable smells of roasting meat, hear the sizzle of the juices as they drip into the pan, while the football game plays in the next room and we wait with longing for dinner. She and her loving mate (my father) consult several times – is it done? They stand together, she making pie dough, he peeling and slicing apples, for her signature dessert, apple pie. Finally, it’s the expert’s turn to create magic – Dad, who learned to cook in the Army, starts the gravy. 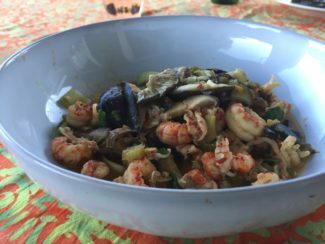 His was the final touch on the meat dishes – a little salt, garlic, onion powder, a dash of this and that – that kissed our food into deliciousness. At last the round, Formica-covered table (quickly built by my father after we discovered the mad efficiency of a lazy susan at an all-you-can-eat restaurant called the Lazy Susan) is set, and nine people gather round its food-laden lazy susan. The canned cranberry sauce is decanted and sliced, still gloriously shaped like a can. Brussels sprouts, buttered; green beans with canned crispy fried onions; mashed potatoes, gravy and the golden bird, wait for us. And the Waldorf salad! How delighted we were for this special occasion salad filled with apples, walnuts, raisins, celery, and tiny marshmallows, in a mayonnaise dressing. We give thanks the Catholic way, and serve ourselves, waiting for each dish as the susan turns. And oh, the stuffing! Sage, celery, apple and onion transformed in the butter, the bird’s juices, and the heat of the flame, into a taste and texture to be, in a word, adored. Warm, moist, soft, chewy, the flavors of sage popping off the palate, with the sweet bits of apple gilded with onion, and the crunch of walnuts – singing of autumn, Thanksgiving, mother and father love, family, home. And now, decades later, I prepare to visit Mom on the west coast of Florida. My father has been gone for 13 years. I am divorced, and though we usually spend holidays together, my dear ex-husband is always on Maui at Thanksgiving. Our daughter is grown and finding herself among friends. My siblings are far away with families of their own. Though Mom gratefully no longer spends hours in the kitchen, I do, for I became a passionate cook, food lover and food activist. It’s a small town, but Mom lives near a wonderful independent health food store whose number is saved on my phone. I’ve discovered the local farmer’s market and the backyard beekeeper who sells raw honey. We’ve also found a great seafood restaurant and market that serves freshly caught fish from the Peace River. We are both gluten-free girls these days; Mom watches her Vitamin K intake (not too many green vegetables); I must monitor oil, alas, as well as dairy and red meat. On Thanksgiving, we will have roasted turkey breast with no stuffing, sweet potato casserole with a pecan topping, Brussels sprouts in browned butter with crispy shallots and hazelnuts, asparagus, roasted Delicata squash with pumpkin and pomegranate seeds, cranberry chutney and a gluten-free pumpkin pie. I will do much of the cooking. The Delicata squash has arrived at the store and they are holding several for us. We are both old, my mother and I. The realm of our gratitude has changed – expanded to include being alive one more day; being healthy; enjoying sunlight and noticing the beauty all around us. We give thanks that the Earth still provides for us, tired and ill though she has become. And we pray for peace. As I sit here writing before I leave my home, I am watching my resident squirrel stand in the now opened pumpkin that sits on the garden table, eating seeds. What a feast for him, too, for the coming winter. The ritual of preparing and eating a special meal with traditional dishes holds deep memories – of being loved, nurtured, nourished, of belonging – whether to your family of origin or your family of loving friends. Food counts for so much, doesn’t it? As it turned out, I burned the shallots, and then burned the onions I tried next, but the Brussels sprouts were scrumptious anyway, studded with hazelnuts, the brown butter a match made in heaven. Everything else was delicious and tasted delightfully of itself. I can’t wait for a plate of leftovers today. I hope your Thanksgiving was blessed with delicious food, family and friends. Enjoy the leftovers and savor the future memories! This is inspired by chef/owner John Platt's fabulous dish at Riffs in Boulder. Prep Brussels sprouts: Wash sprouts; thinly slice off stem; slice in half; peel off any yellowing leaves; cut each half in half; soak and clean in bowl of water. Place on a towel and roll up to dry. Saute sliced shallots in 2 tablespoons of olive oil until soft and golden. Melt butter/ghee in frying pan. 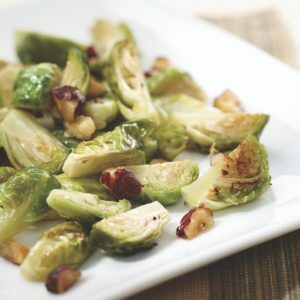 When it is sizzling, add Brussels sprouts, stirring often to coat and cook till soft, about 10 minutes. Serve topped with hazelnuts and fried shallots. Also good without shallots. Enjoy!